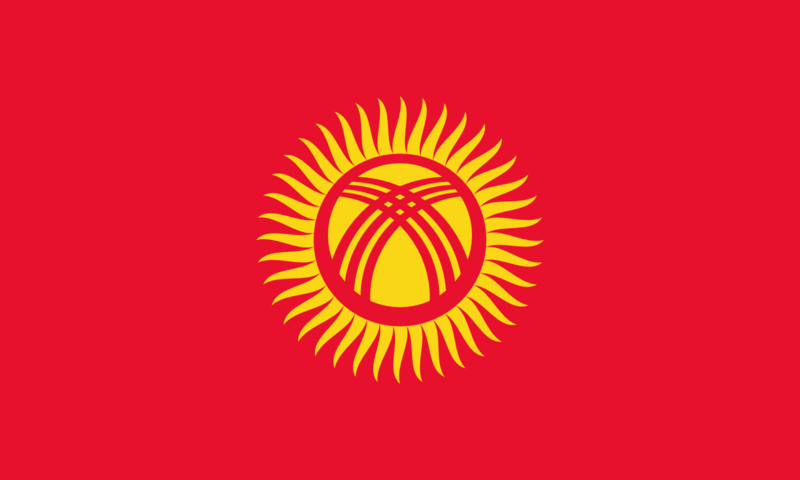 The flag of Kyrgyzstan consists of a red field charged with a yellow sun that contains a depiction of a yurt (traditional tent). It is actually a depiction of the first thing one sees when waking up in a yurt; namely the construction of the pinnacle of every Kyrgyz yurt with 3 criss crossing laths across the circular opening at the top of the yurt. Adopted in 1992 – just over seven months after the country’s independence was declared – to replace the flag of the Kirghiz Soviet Socialist Republic (SSR), it has been the flag of the Kyrgyz Republic since that year. Although the colour of the flag is identical to the former Soviet flag, the red is said to be inspired by the pennant lifted by Manas, the country’s folk hero.